Adjustable fuel pressure regulator, Adjusts from 1 to 6 psi. Includes brass fittings. Chrome plated body. For use with carburetor fuel systems only. Not for fuel injected engines. Maximum inlet pressure 9 psi. 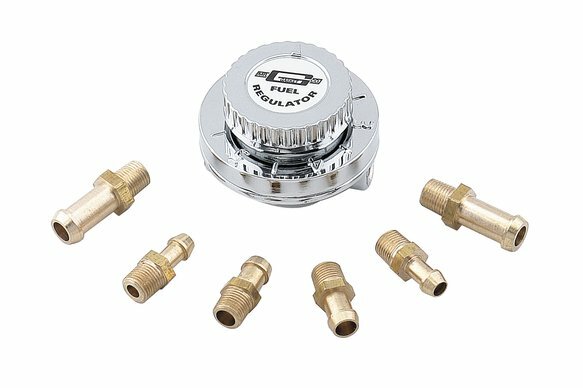 Adjustable from 1-6 psi, Includes brass fittings for use with 1/4", 5/16", or 3/8" fuel hose. For use with carburetor fuel systems only & engines not exceeding 400 HP. Select desired pressure settings via selector knob located on top of regulator. 2.25" Diameter chrome plated body.